It's time for part 2 of our new Throwback Thursday series, where we re-post offerings from years gone by that could have some relevance today. Last week I reminisced over the time I "solved" the Rugby World Cup's match turnaround problem back in 2011. 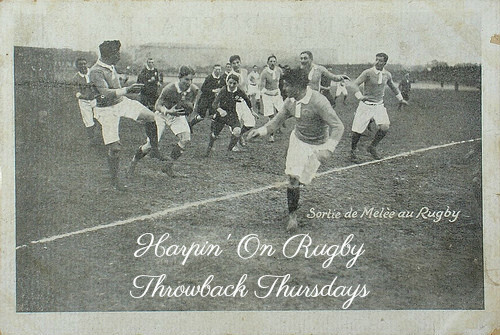 This time we're going to the "Harpin2" blog we ran from June 2012 to June 2014 and a post from @curates_egg published in the week leading up to "that" clash with the All Blacks in 2013. As well as providing an accurate observation on internet opinion, the author also offers a Joe Schmidt XV which is scarily close to the actual RWC2015 one - bar the post-BOD centre pairing which, let's face it, nobody saw coming. The following selection is an Irish XV to face New Zealand on Sunday based on comments on various Irish media sites (irishtimes.com, thescore.ie, independent.ie, examiner.ie, rte.ie) and tweets over the past 3 days. I have tried to provide the logic given online for each selection. A quick glance would show the IRFU maybe got the wrong man in appointing Joe Schmidt for the Ireland job and should, instead, have hired the Internet. 1. McGrath - Healy should be dropped because he is too old and isn't performing to his top standards. 2. Cronin - Offers more than Best and Best should be dropped for underperforming. 3. Archer - Mike Ross had a bad game and has struggled to adapt to the new scrum rules, so the Munster substitute tighthead should start. 4. Tuohy – POC has passed his sell-by date and we need to move on to the next generation. 5. McCarthy - Toner is too tall and too ugly, and we don't watch Ulster, so McCarthy gets the nod, even if his conditioning is seriously off. 6. Coughlan - Heaslip needs to be dropped, so Coughlan moves in to play in a position he is unfamiliar with to accommodate this. 7. O'Mahony - moves to 7 to enable Sean O'Brien to move to 8, as Heaslip needs to be dropped. 8. O'Brien - an easy selection for the Internet, which loathes Heaslip's headphones and jeans. Heaslip is rubbish and does nothing. He needs to be dropped. That Cardiff guy (who was shown the door from the Leinster Academy and nobody paid any attention until someone mentioned his name in a comment somewhere) is the long-term answer but, until then, O'Brien should play at 8 (even though he hasn't done in 2 years), so we can rid Ireland of Heaslip. 9. Marmion - he is the future, so start him against the All Blacks. 10. Jackson/Madigan - either because Jackson stands too deep, kicks too much and can't place kick or because Madigan is a flashy Dan and (buzzword alert) has no game management. 11. Trimble - even before McFadden's injury, he should've been dropped because he is not 'international class' and it doesn't matter if he was our best performer against Australia. Saw a couple of commenters suggesting O'Halloran on the basis that youth should be given a chance...against the All Blacks. 12. Marshall - no odd logic can be found online to support his inclusion and no other options are really mentioned. 13. Cave - despite not even being the first choice 13 for Ulster, he must start because BOD is passed it and is an embarrassment (despite playing well in his other 2 games this year). 14. Bowe - because he is international class no matter how badly he plays for Ireland. 15. Henshaw - because Rob Kearney hasn't played well since 2009 (the European player of the year award was nonsense). 1. Healy - one of our least-bad performers on Saturday. Despite McGrath's major leap forward over the past 9 months, Healy is still number one and always ups his intensity for New Zealand. 2. Best - despite continuing line-out problems, he is the best of the pack and his loose play is normally excellent (last week an exception). Cronin is a good impact sub. 3. Ross - struggling with the new scrum laws but his problems last weekend were very much linked to the second-row. Archer is not the answer - based on last weekend's performance and the fact he is not even first choice at Munster. Hopefully, Schmidt will put Fitzpatrick on the bench: he has done well against New Zealand before and is better than Archer (Moore is not ready for this level). 4. O'Connell - our captain now for better or worse. Put in perhaps his worst ever Irish performance last weekend but showed for the Lions over the summer that he can still perform at the highest level. Needs to bring his intensity™ to the game this weekend and Schmidt will be hoping 'Paulie' will. 5. Toner - Schmidt likes him as he is a big target in the lineout. Personally, I would pick McCarthy to make our scrum a weapon. The selection of Toner and O'Connell will underpower the scrum. 6. O'Mahony - still adapting to Schmidt's system but looks keen to do so: needs to focus on basics at ruck-time though. 7. O'Brien - no alternative to picking O'Brien at 7 with the injuries we have but Ireland need to sort out what exactly is expected from him. As Lions tour showed, is still a world class operator when given a clear role. 8. Heaslip - thankfully, all his coaches value the enormous breakdown work Heaslip has to get through to compensate for us having no other backrow who does it. A no-brainer for Schmidt...much to the chagrin of the Internet selectors. 9. Murray - Schmidt's call on Reddan didn't pay off. Murray has not looked sharp this season and his box kicking has been awful at times but there is no alternative. Looking like a problem position for the 6 Nations. 10. Jackson - The loss of Sexton is a massive and fundamental blow to our chances. Schmidt will recognise we need to establish a platform and Jackson is our best option for doing so. Harsh on Madigan but probably the right call. 11. DKearney/Earls - toughest one for Schmidt to call. If Earls is fit, he has to slot in for the injured McFadden. Kearney has been one of the brightest outside backs in Ireland in 2013 but a big ask against New Zealand. 12. Marshall - one of Ireland's only players to play well against Australia (with McFadden). Schmidt used his experience logic to justify selecting D'Arcy outside Jackson for the Samoa game but hopefully will not fall into the same trap, and will keep an eye on the future. 13. O'Driscoll - very short of game time but there is literally no alternative outside centre in Ireland at present, in spite of what the eminent George Hook believes. A lot of expectation and pressure on Payne for next year though. 14. Bowe - put in his worst ever Irish performance against Australia but remains one of Ireland's frontline internationals. Schmidt will be hoping he can put the aberration of Saturday behind him because we are getting very thin in the backline. 15. RKearney - Schmidt will give him every chance to prove his fitness because the alternative doesn't even bear thinking about. Henshaw has looked totally out of his depth with each chance he has been given for Ireland. If Kearney does not make it, it would not be a total surprise to see Madigan selected there. 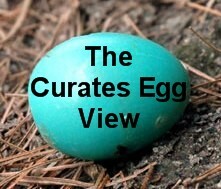 @curates_egg : Expat Irish rugby fan living on the continent but regularly travelling to Leinster and Ireland rugby matches. Strong believer in rugby as a family game and a fair sport.